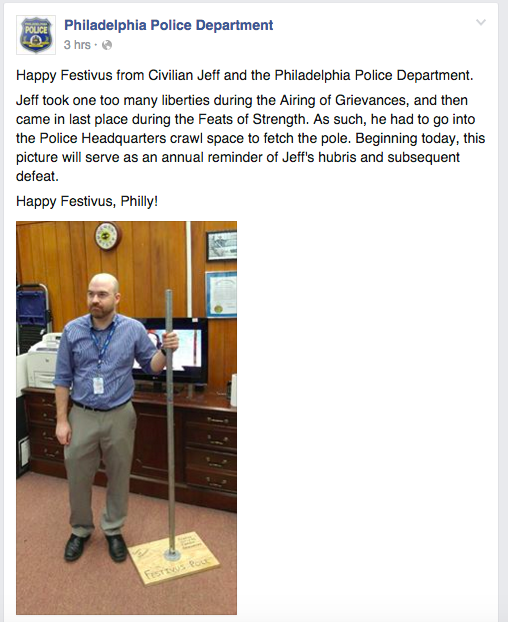 Philadelphia Police have a Festivus pole on display at police headquarters. It's the Seinfeld-inspired holiday when blatantly airing your grievances not only is acceptable, but expected. So forget New Year's Day and its Mummers Parade. If there ever was a holiday catered toward Philadelphians, this is it. Over the past year, we bemoaned an uninspiring lot of mayoral candidates. We griped about massive security restrictions that shut down Center City during the papal visit. And we're still grumbling about our beloved, Super Bowl-lacking Eagles, their fragile quarterback and so-called genius coach. So it came as no Festivus Miracle that some of our most prominent organizations, agencies and establishments took a moment Wednesday to celebrate the made-up holiday. Ever informative, The National Constitution Center noted Festivus briefly was recognized as a religion in California, thanks to an inmate who listed it as such when he refused to eat the prison's salami-heavy diet. The Phillies have inspired no shortage of grievances in recent years — their own rookie third baseman, Maikel Franco, even filed a formal one earlier this month. Nevertheless, they too got in the Festivus spirit. 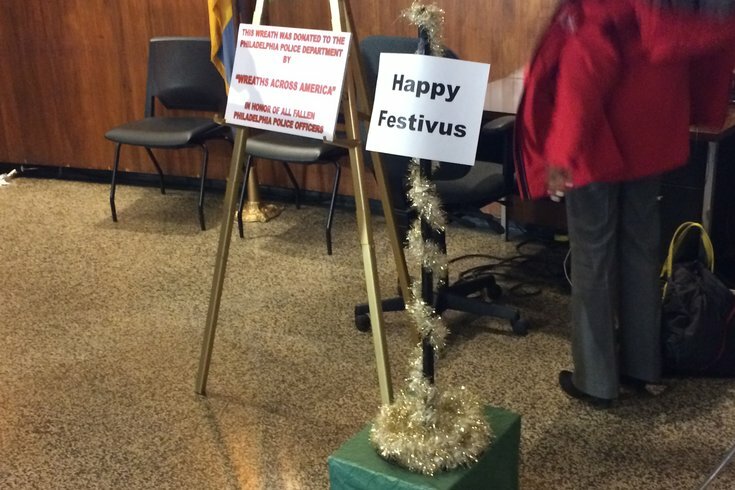 The Philadelphia Police Department recognized the holiday early Wednesday, decrying the glitziness of tinsel in true Frank Costanza fashion. Police then forced the loser of the department's Feats of Strength competition to dig out its aluminum pole. And promptly embarrassed the man with a photo. And that's enough of all of this. Because, no offense, this holiday is a little ... out there.